If you own a 2005-2008 or so VW, then this will look really familiar. 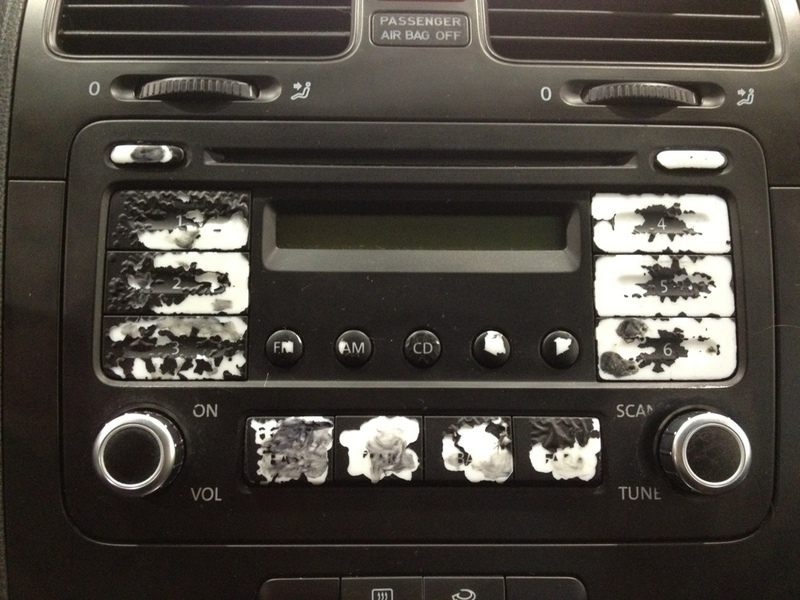 This is a radio from a 2006 VW Jetta with the radio buttons peeling. The black “soft touch” has peeled off, it almost looks like it melted. This happened on some of the switches in the car too. My thought was that chemicals we put on our hands, lotions, and anti-bacterial, accelerated the wear on the buttons. The buttons are not replaceable individually. I have heard of companies that can replace the face of the radio so you could keep the stock look. Like with any factory radio issues. I think you are better getting a good aftermarket radio. You will get more features at a better price. I was walking through the parking lot one day last week and walked past this little part bag. I happen to read it while walking by. It took a second for my brain to catch up and realize that the description was something weird. I had to walk back and pick it up. 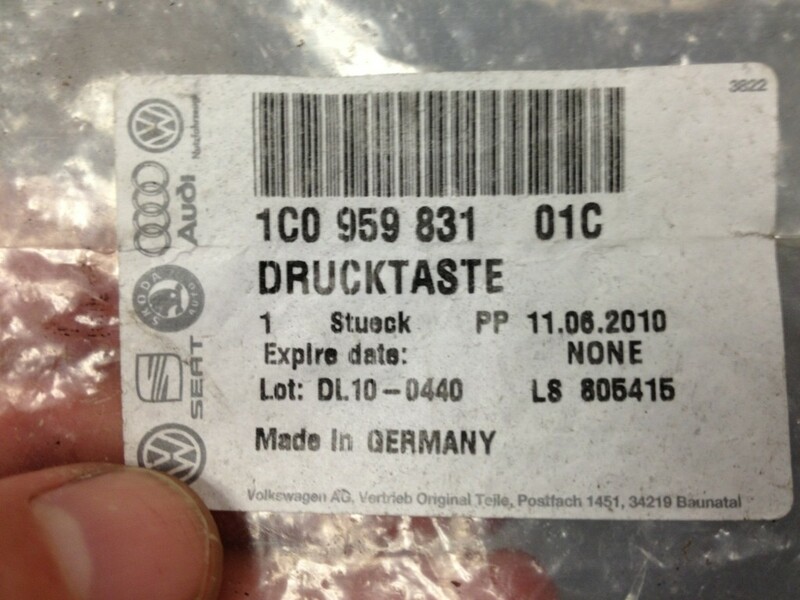 DRUCKTASTE, what the heck does that mean? Since I do not know German, it was Google Translate to the rescue. It turns out that DRUCKTASTE means PUSHBOTTON. This was a package for a trunk release button. In all the years I have worked for VW, and all the push buttons I have replaced. I never noticed what the package said. That is your German lesson for today. I feel like I post a lot of smashed VW engine oil and transmission pans. This pan is from a 2007 or so Beetle. If you look at the lower left part of the picture, you can see some grass smashed up into the sub frame. This car had ran off the road. The good thing for the customer is they didn’t break the pan. It smashed it, but there is no fluid leaking. The thing to be concerned about is the damage to parts behind the pan. There are electronics that live on the other side of that pan. Any impact can destroy them. That makes for a very unhappy transmission. I am surprised there is not a fluid leak. 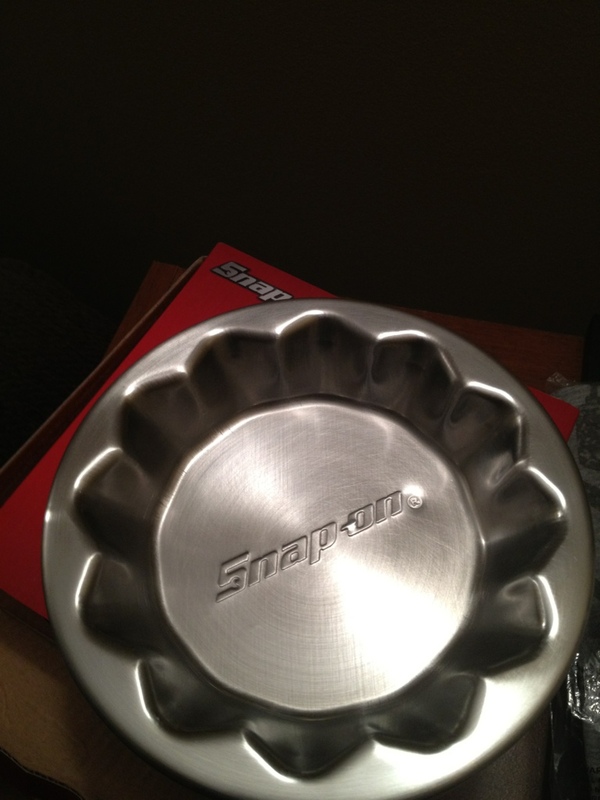 Okay, you might be wondering why I am posting a picture of a Snap-on cake pan. Well this is actually a really cool Snap-on magnetic tray. I got this from my tool dealer a while back. I am so excited to reach 33 volumes of Shop Shots. I want to give this away. So here is how you can get this tray. Share this post on Facebook. You can either click the icon at the bottom of the post, or share it when from my Facebook post. Tweet this post out. If you are on Twitter. Share the post on your website or blog. Pin ANY of the pictures on the post. Sign up for email updates. See the upper right corner. If you are signed up already, I will give you an entry. It is really just that easy. You can enter as many times as you share the post. Just post a comment here and let me know how you shared. I will draw someone at random and send them this brand new Snap-on tray! It is just a small token of my appreciation for all of you! I will pick a winner Friday evening 10/05/12! I wanted to ask you about the peeling buttons. I have read on numerous blogs that a lot of people had peeling issues with their radio and window buttons in their VW’s. Was this isolated to 2005-2008 or are you seeing this with newer models as well? @Rudy, Thanks for the kind words! Kevin pretty much hit it right on the head below. They changed the buttons from soft touch to a hard plastic in 2008. Haven’t had one peel since. Even the replacement radios came with plastic silver buttons instead of soft touch in the 2006-2008 models. Much better now. Damn, I don’t have a chance. I don’t have a Facebook or a twitter thing. Or a website………. I will also add everyone that is currently on the email list. 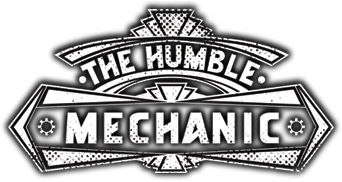 AND if anyone signs up on the email list, I will give them an entry too..
Whoah I have never seen buttons do that, but then most of my cars are geriatrics. So can you get replacement buttons as a set from VW or is it better to just swap out the whole radio? VW doesn’t have any repair for that radio. It is a replacement only. No repair, yet they recognise there’s an issue with those? How odd! Sent it to Facebook, I’ll check back again next Wednesday. Nice looking site. Liked & shared your Facebook page. Also enjoy seeing your pics on Instagram. Great site, glad I found it! I subscribed and facebooked it! I pinned one of the pics, I have more people looking at my pinterest than twitter or facebook. the oil pan issue is a big one mostly with lowered cars. 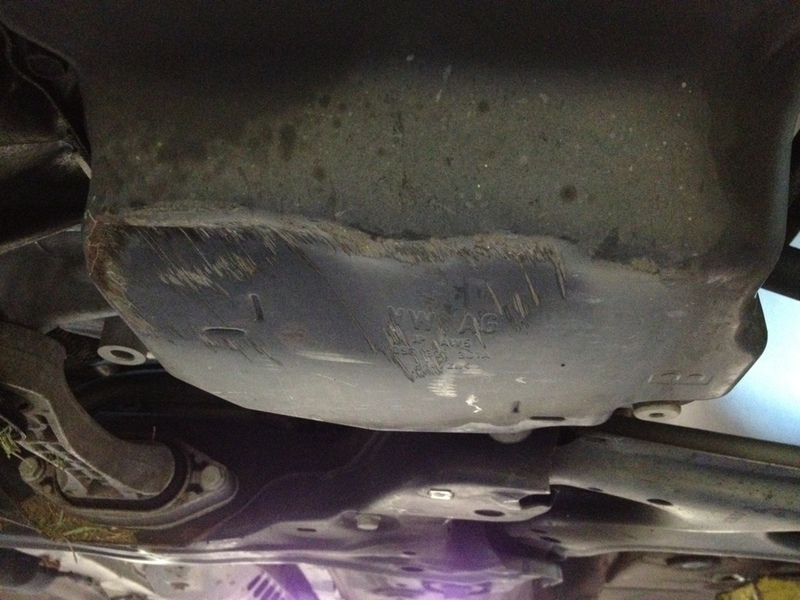 its why we created our skid plate pans we were sick of worrying on our own and customers cars. we use older style pans mk3 as our base factory parts which get reinforced with 1/8 in galvanized steel so you retain stock pan profile and oil pickup but gain some added security. 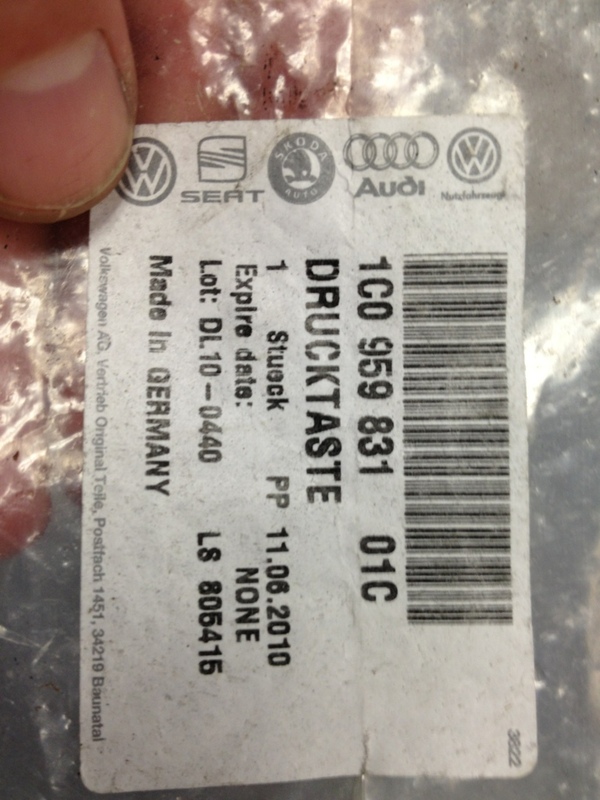 I have a customer with a 2006 jetta same problem with a few of the buttons not quite this bad though. I love the idea of the 1/8in pan! Sadly we see this all the time on stock height cars. Most folks that lower their car are more aware of the height of the car. People that are your average car drive have no idea how low their car is. We are forever seeing scraped up pans, busted belly pans, and front lip spoilers torn off. I have even scraped the front of my Passat a few times. Regarding the buttons, most people not knowing about the soft touch paint, make the mistake of using ArmorAll when they clean their VWs. When I bought my pre-owned Jetta, I noticed that the paint on my window buttons had a liquified look to it. I figured that the driver must have used hand lotion quite often. But the good part was, that the dealership replaced the head unit, and the window buttons, which were covered by the Certified Pre-Owned warranty.